Not all straws are created equal, and if you would like to get your day off on a delicious start, then this $3.99 Extreme Chocolate Milk Straw & Pods does seem to be worth checking out. 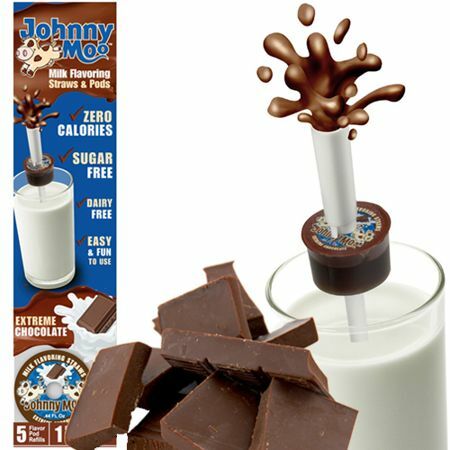 It has been dubbed as the K-cups for kids, where the Extreme Chocolate Milk Straw & Pods offers a rich velvety chocolate flavor right from the start and all the way to the end. Your mouth will most probably be begging for more, and this is one instance where both adults and the little ones would jostle with one another in order to have a go at it. These unique flavor pods happen to be sugar free, dairy free, and have zero calories, so that they’re a snap to make use of. Each purchase comprises of 5 flavor pod refills and 1 environmentally-friendly washable and reusable straw.